I am so monumentally, over-the-top thrilled to introduce to you our new page, Good News Sunday. 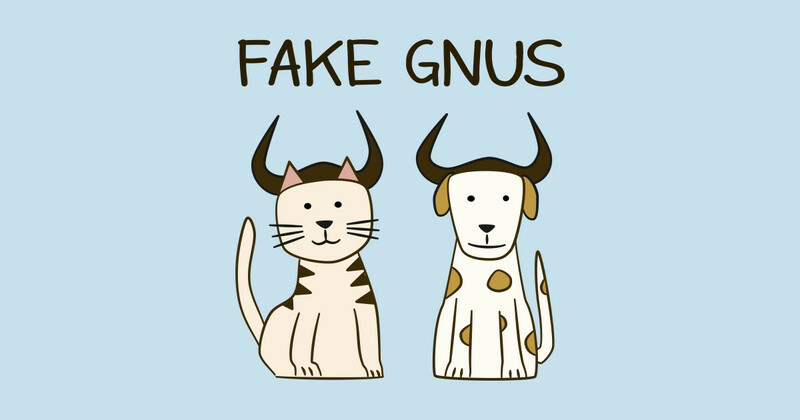 (I thought about giving it a jaunty abbreviation, then GNS made my twisted little brain think GNuS, which made me think about a cartoon I'd seen about Fake Gnus ... hence the cartoon at the top of this page). And while you can correctly surmise from my opening paragraph that I intend for The GNuS to be upbeat and light-hearted, I absolutely guarantee that it won't be fake. The page will be exactly what it sounds like – good news stories about the awesome things local non-profits are doing in our community, success stories from every sector of the city, updates on local sporting teams who don't usually get a media spotlight, columns from people who have something positive to say, and – I hope – letters and photos from YOU, highlighting the beauty, dynamism, diversity and delight that are the cornerstones of our vibrant city. To be clear, this isn't just some cutesy way to package existing content – articles will be specifically sourced for this edition, and you won't have to dig through other Castlegar Source coverage to find these happy offerings. Good News Sunday is a dedicated page, and if you go to the top of the Source homepage, you'll see a hyperlink at the top that will bring you directly to all the GNuS you can use. While this idea may seem sophomoric at first blush, it was actually born out of some very complex journalistic, societal and commercial concerns. I can't tell you how many times people have told me in recent years that they decline to follow the news at all anymore - “If I want to be that depressed, I can just try to balance my chequebook”. Car crashes/conflicts/catastrophes, forest fires and floods, even fictional walls to be built out of bricks comprised primarily of prejudice, fear and ignorance. It's exhausting, demoralizing, and most importantly, it paints an inaccurate, biased, and brutal picture of the world around us that just isn't real. As much as everyone likes to blame reporters for this, the simple fact is, a fatal accident will garner hundreds of times more readers than will an article about a local pee-wee team's recent win. And that's really how it should be – that fatal accident will create immediate safety issues on the roadway in question, of which you and other drivers need to be aware. It will also often have a lessons-learned component that will help people remember not to, say, drive without winter tires, for example. Finally, in a community as small as ours, there is an emotional tsunami associated with this sort of event, and stopping the rumour mill from wild speculation and exaggeration with correct and timely information is critical, as is warning each other that today might be a good day to be a little more gentle with the people we encounter therein. My point being, we (reporters) aren't vultures or ambulance chasers for writing the hard, brutal, heartbreaking news, and nor are you (readers) venal looky-loos for reading that coverage before you read about the $200 raised at yesterday's grade school bake off. But that creates a real challenge on our side of the table, as coverage requires resources – we can't cover it all. We have to pick and choose and prioritize, use what we have room for, and reporters for, and we'd be breaching our advertisers' trust if we didn't use the articles you guys are most likely to read, not to mention violating your trust by not posting things you really should know about. It's the tyranny of the urgent over the important. It's the right thing to do, but it doesn't stop it from sucking. I adore Castlegar ... in fact, I love it so much that I've invested my life savings, 12 years of my career (so far), my son's childhood and my professional future in this town. Anyone who thinks I gleefully rub my hands together and take joy in covering tragedies that will give me a readership spike but will also force me to break my community's collective heart and weaken it's spirit? Suffice it to say, those people need to reassess their world view, because they're getting it all wrong. So, I want to give my community, my readers, and yes, myself, a breath of fresh air. Make no mistake, I will still cover the hard, the horrific, and the hurtful. I believe very deeply that it's an important job, and one vital to the health and safety of my people. But this place, this page will, I hope, round out the negative coverage and provide a more honest, accurate, valid perspective on our community. There is so, so much good here. There is so much in which to rejoice, so many opportunities for humour, fun, gratitude, learning, growth and adventure. I hope celebrating that excites you as totally as it does me. Welcome to Good News Sunday!